Now that it's asparagus season, it's time to break out every great asparagus recipe and enjoy the freshest asparagus you can get. For me, there is a farm right across the street from our subdivision that grows and sells asparagus, freshly picked. On Saturdays here, the farmer's market has loads of fresh asparagus. This frittata is one of the easiest things you can make and it not only makes a nice breakfast, but a great light lunch, too. 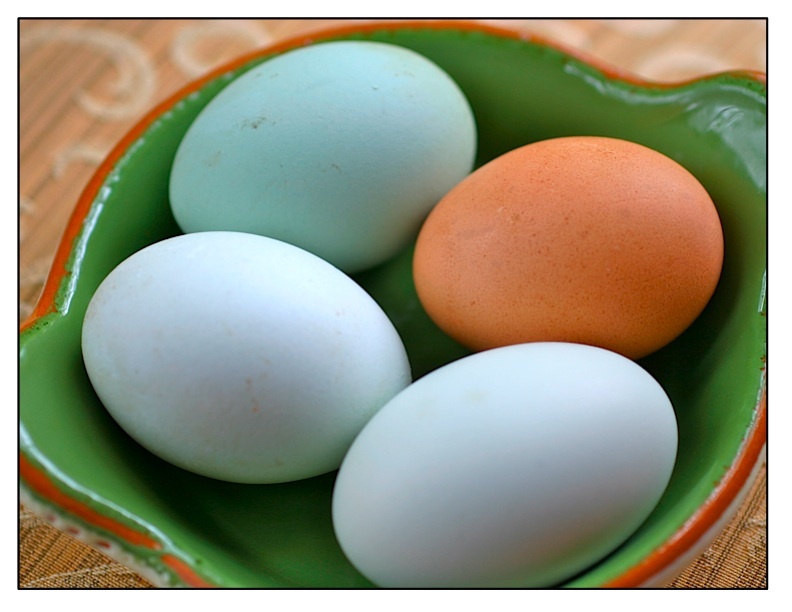 I use fresh eggs from a local farm that come in a range of beautiful colors. 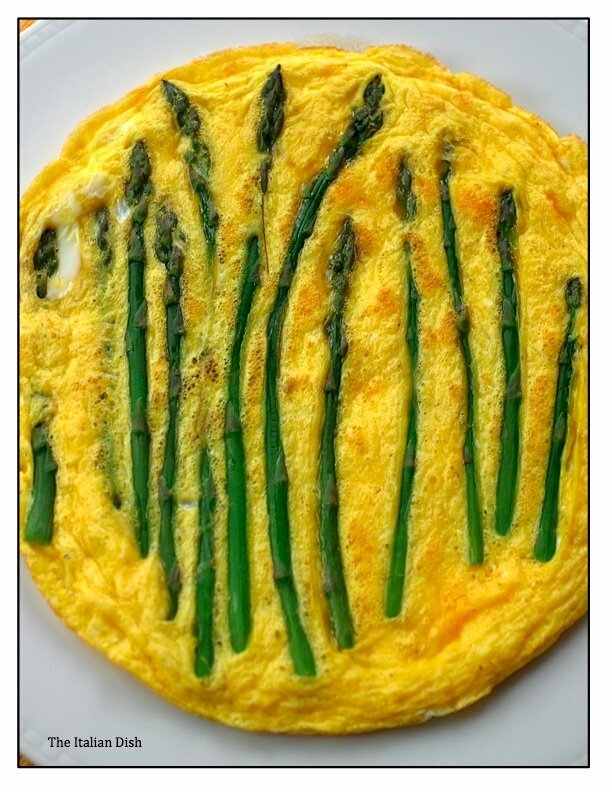 You can use whole stalks of asparagus or slice it into 1 inch pieces. When you make this frittata, make sure your broiler is ready to go. 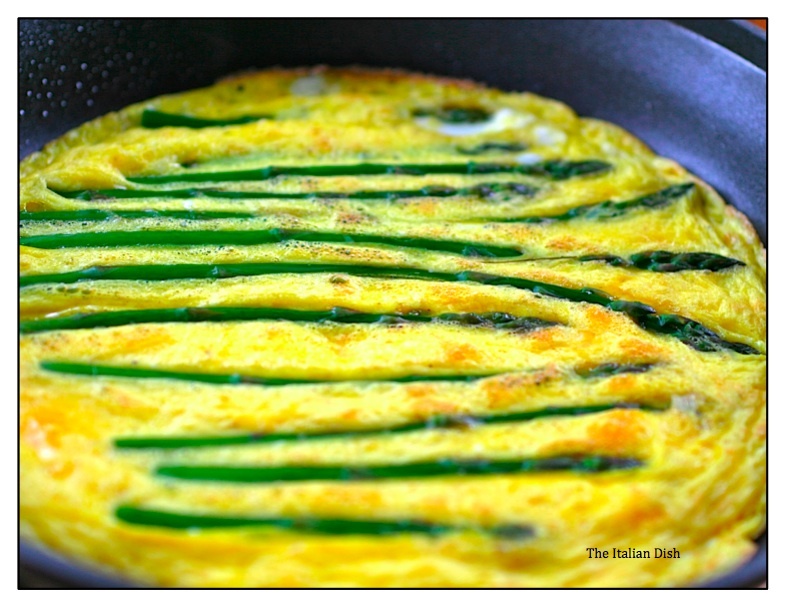 Once you steam the asparagus, the frittata takes only a minute to make. You don't even have to have a skillet with an oven proof handle - it will barely be under the broiler for 20 or 30 seconds. Preheat your broiler. Break eggs into a bowl and beat with a fork. Add the cheese to the eggs. Steam the asparagus until tender. Heat a 10" nonstick skillet. Spray with cooking spray or add a little olive oil or butter. Add egg mixture and place asparagus into the eggs. Cook over medium heat for about 30 seconds. Place under broiler until top is barely set, but not overdone. Do not overcook the eggs. They should still be just a little soft. Slip frittata out onto a serving plate. Cut into 4 wedges. yummmy! I am going to make this for work... they will love it! For me it's the farmer's market in my neighborhood! This is my favorite season, I just love the explosion of fresh produce. Beautiful photos! What a beautiful frittata. Our farmers market doesn't begin until the middle of July! I'm envious! Must be the season - I made this yesterday. 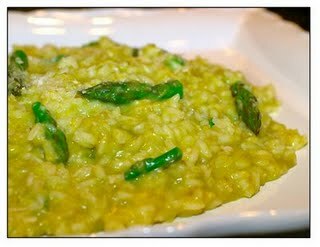 And I made risotto with asparagus the night before only I added fresh silverbeet (spinach) from our garden. i love the way you cook and eat! I particularly admire your commit to change the way you are eating. Making some changes of our own at home base. I look forward to trying some of your recipes and ingredient ideas. Thought you would appreciate this TED conference video from Mark Bittman of Food Matters. I like what he has to say and I think you are a healthy contributor to this model. keep the wonderful ideas coming. Gorgeous photo! Wish I had that for breakfast today. Beautiful, simply prepared frittata. Delicious! LOVE that photo. Can't wait to make the dish! Alisa: Thanks for the link! I love Bittman. this looks delicious. You have to make this for me sometime. This recipe is outstanding! It is well layed out and the colors are magnificent. Great job. Oh wow! such great colours!!!! This looks so light and healthy and deliciously spring-y!! I'm loving it! That first photo is just perfect. I'd have been tempted to cut the asparagus into pieces, but your way is far better for presentation. that is absolutely gorgeous. period. This is the prettiest frittata I have seen. What a beautiful idea!!! !